Most beginner to intermediate advertisers don’t use Power Editor. The typical advertiser has never even heard of it. Instead, they use the self-serve ad tool. This is their entire exposure to what Facebook advertising is all about and what it’s capable of doing. The problem, however, is that such advertisers are missing out. There are several reasons why you should ditch the self-serve ad tool entirely for Power Editor (a free browser plugin). Make sure that you also see my post about Bidding. Today I want to focus on Placement. This post will highlight the ability (or inability) of an advertiser to control the placement of ads both with the self-serve ad tool and Power Editor. For the purpose of this comparison, I want to create an ad that promotes a page post. This should be a regular need of advertisers, particularly to reach Fans in the News Feed. A use case here is recreating a Promoted Post, but having more control over things like targeting and bidding. Within the self-serve ad tool, you first need to select that you would like to promote your Page as the destination. And now we run into an obstacle. How do you make sure that post only goes into the News Feed? Or sidebar? Or mobile devices? Facebook provides a preview of the ads created. 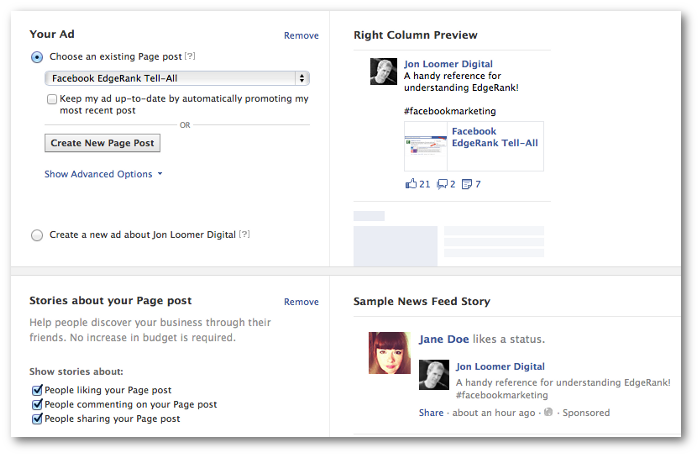 As you can see in the previews above, Facebook generates an ad for the right column. Sponsored Stories for liking, commenting and sharing are also generated for the News Feed. Nope. No mention of placement for either ad. In other words, Facebook will place these ads anywhere they can. VERDICT: The self-serve ad tool does not allow you to control placement in anyway. You are at Facebook’s mercy. Now let’s create an identical ad within Power Editor. 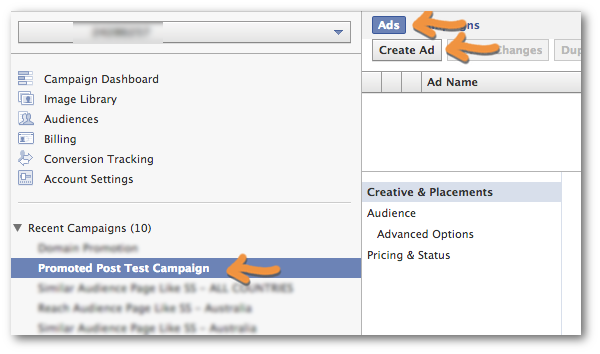 Select your current campaign, click on “Ads” and then click the “Create Ad” button at the top. 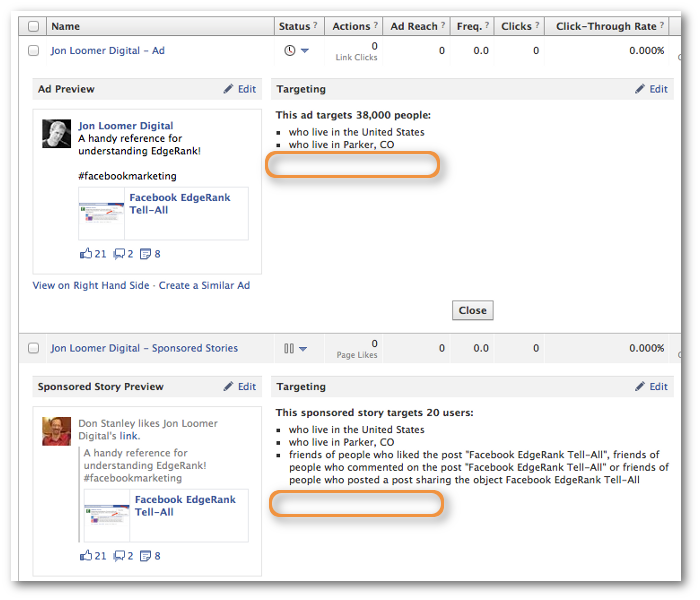 Next you’ll select your Facebook Page (the Destination) and the post you want to promote. How awesome is that? The only placement you can’t select is Sidebar Only. That would be nice, but it’s not an option. By default, your ad will show on all mobile devices. But you can choose to show it only on Apple or Android devices. 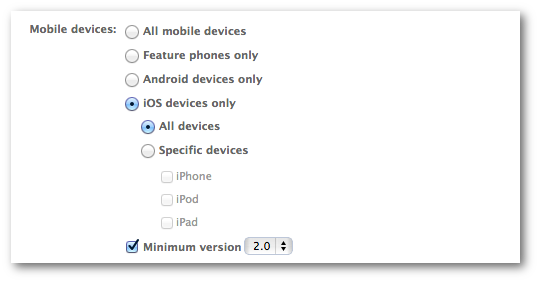 In fact, you can also choose the specific device (iPad, iPod, iPhone, for example) and set a minimum version. That’s crazy! That makes for incredible control over placement. VERDICT: You have nearly full control over where your ad is shown when created in Power Editor. This is a night and day comparison. But it’s one that needed to be made to help you make the switch completely away from the self-serve ad tool. 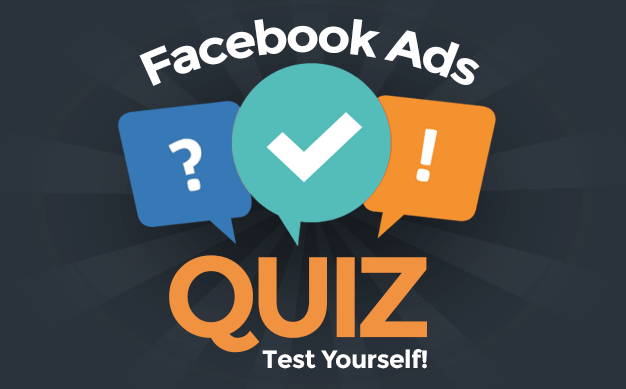 You have no control over where your ad goes when using the self-serve ad tool. The result is that you are throwing money away on inefficient placements. Is the self-serve ad tool easier to use than Power Editor? Sure, it probably is, particularly on a single ad basis. But how much money is that worth? It’s time that you master Power Editor! Sign up for my Power Editor training course and stop throwing money away on ads that don’t work. Pre-pay before the program officially launches this week and get half off!